Getting amazon music to work with echo in SA. Does anybody know how to get amazon echo to work amazon music or another music service that can play songs on demand? I have tried settings up with irish debit card and I could play music on my pc, but the echo says the song was not available to play when I tried it on the echo. Should I try virtual USA card? I do have amazon prime. Got it working, removed all addresses. You can also get spotify no problem. Download off us app store or apk - use free tunnelbear to sign in and sign up. The first 3 months costs 99cents. You just need to log in twice a month from tunnelbear us with spotify to make it think you back in us - which takes about 1 min when using the app. I dont think so, through did not try it. Not touching the account now, as I don't want break it. only other option is amazon prime and getting 1% of the library i want, or just stick it out with tunein until (hopefully) spotify launches next year. So last night I had a chat online with Amazon to see if I can get amazon music without us billing address, very nice guy said he did something with my echos (was very secretive) but need a us credit card for music. 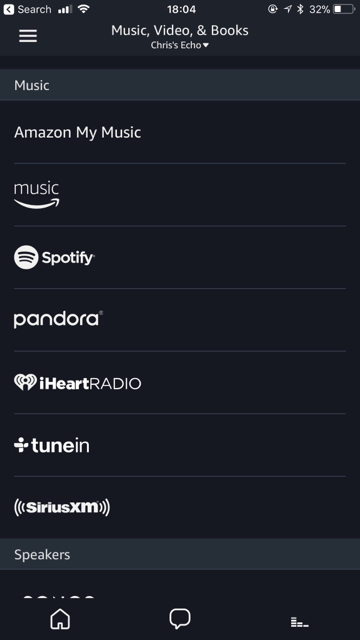 Just now I went into my alexa app and could link Pandora, iheart etc. Clicked on them and now they linked. Can play Pandora, iheart without vpn. Honestly no idea why and how this is happening - but very happy! On iPhone still says in wrong country. Luckily my sister lives in us so will sign up for 3 month spotify account for 99c. But Pandora free version is awesome! Hi Guys . I have a created a service that works flawless for Alexa . So you can subscribe and use Spotify and pandora on Alexa. PM me if you interested . His solution is PayPal which doesn't work anymore, as far as I am aware. Tell them to download Pandora via us app store and then create account via vpn. Then you can play any artist you want with some ads ( very minimal). I actually have spotify but Pandora is my go to station. You can say to Alexa, play queen radio - then she starts playing music similar to queen (inclusive of songs by queen). Or they can sign up for a paid for service like www.musicforworld.com where you pay them 9.99 us dollar a month and they send you a spotify account that works in SA. My brother has just brought Alexa in the uk. What app dose he add for this to work in SA. I’m sure this has been asked before but I’ve just joined the site. I’m in the uk and he is visiting. Sign up using his Uk bank card and use UK address, then it will work here. No need for vpn. I bought a Echo Dot this week. Got around and managed to set up a few skills and region etc, but certain services is completely blanked out or not activate able because we are in South Africa. The AI on Alexa is amazing, and you could literally have a normal conversation if you are that lonely. I also have an Simfy Africa account, any advice on how I can maybe set it up? I Emailed Simfy about this, and said I must try with Bluetooth?? How on earth do I do this? I don't have a us credit card, address or anything I can use. @Chris_SA, how did you contact this person, and can he maybe do the same for me? Also have to enable/set up all the Sonoff enabled devices on a later stage. Hi. I’m keen to try this - flying through Uk end of April. Is Spotify working ok it - now that it’s open to za? Spotify works 100% - if you are a paid up subscriber( not available on free version). Just use spotify. No need for Amazon music. Oh and sign up for Pandora radio (just use tunnelbear vpn). Then you can stream music for free.